There aren’t many useful smartphone apps out there that pertain to knives—in fact, there aren’t more than a handful. There’s a great app called Kitchen Knife Skills that shows you how to expertly cut difficult foods like avocados, but other than that there’s not much for the knife fanatics. That is, except for the absolutely amazing Knife Steel Composition Chart. We recommended this app back when it came out in 2012, but we thought it’d be wise to come back to the app because it’s definitely a must-have for any collector, custom knifemaker or knife knut. 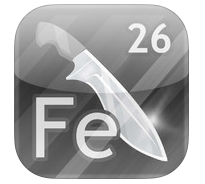 The app is a knife steel composition and name cross-reference database for all types of alloys used in knife blades. According to the description, the app features about 5,600 alloy names and more than 930 compositions, which covers pretty much anything you could ever want to look for. Some of the things you won’t find are proprietary steels, which are classified. For those who like to get deep down and dirty, there is a composition comparison that has a bar graph with three different options that show the mass percentage, molar masses and atomic count per 1,000 atoms. If I lost you there, chances are you probably won’t use that part of the app too much, but the app could be a great resource if you’re trying to learn more about the steel composition of the blades in your collection. One of the most useful things in the app is the “Notes” section of each steel type that gives a brief description of the steel—like where you’ll commonly find the steel and some of the characteristics of it. Another really useful resource is found not in the app, but on zknives, the website of the creator of the app. The chemical elements effects on steel portion of the site gives a nice breakdown of what effects each element has on the steel. For example, the section says that Molybdenum prevents brittleness and improves machinability and resistance to corrosion. This helps put some of the steel compositions found in the app into perspective. The website in general has a lot of great resources, so we also recommend checking out zknives. This app isn’t for everyone. Casual knife enthusiasts will never have a need for it, but at a cost of $0, it’s definitely something you should have on your iPhone or Android just in case the situation ever arises that you need to the composition of a certain steel. 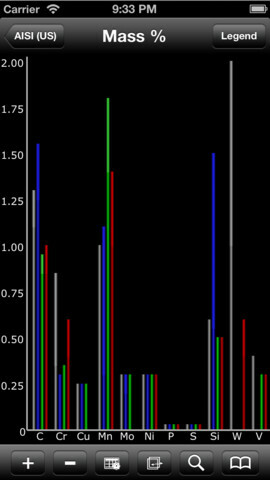 You can find the iPhone version here and the Android version here. Let us know if you’ve used it and your thoughts on it in the comments. Looks like a great app! I don’t have any knife apps on my phone right now unfortunately, I’ll snag that one real quick. I have this app installed on my iphone. It is a very wonderful reference! This is a must have for anyone who uses knives regularly. Also, this app is kept well updated. It is easy to use and as of now I still haven’t seen any glitch.